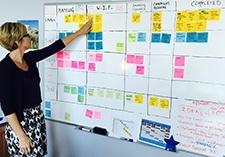 I discovered Agile last summer when my company opened an onshore Agile development center. While researching and writing an Agile e-book about the mass adoption of Agile development, I became enamored with the basic concepts of Agile: transparency, improved communications, innovation, empowerment of team members, customer-centric and iterative approaches, to name a few. I pored over web pages by leaders like Scott Brinker, Mike Cohn, and Jim Ewel, who advocate for Agile marketing practices, there was no turning back. The benefits of Agile were simply too alluring. Millennials are flooding the workplace at a rapid rate, and corporate culture is changing as a result. Millennials appreciate constant feedback, authenticity, instant gratification, real-time communication, and full-on collaboration. An Agile Methodology Marketing program offers all this and more. Implement Agile, and along with it comes daily standups, more cross-functionality, visibility into the business, customers, sales, and much more. Get ready to watch your team soar! Sorry to state the obvious, but…everything is digital and digital is everything. Digital means faster projects, shorter delivery cycles, and real-time reporting and feedback from customers. This is Agile’s breeding ground. Using an Agile framework allows marketing teams to react to that real-time data and meet evolving needs, without having to change the whole course of a program. You can more efficiently digest customer feedback, campaign results, social media trends—and make adjustments on the fly. Today’s most successful digital marketing teams include a diverse mix of talent, from content producers, visual designers, and web/IT leads to marketing technologists, sales executives, and sales ops managers. Agile provides a great framework to bring these constituents together—whether through daily standups, sprint reviews, or retrospectives—to talk about key project priorities, challenges/obstacles, and innovative ideas. A higher level of transparency minimizes surprises and helps teams constantly assess priority to deliver high customer value more quickly. Gone are the days when you planned ad-nauseum every last little detail of an online campaign. Using Agile, you plan, execute, test, adjust, and continuously improve. As stated in the Agile Marketing Manifesto, “adaptive and iterative campaigns win over big bang campaigns.” Today’s marketers are all about A/B tests, personalization, and iterating. Loveable imperfection is our rallying cry, with done being better than perfect. Customer is King. Now and Always. Technology has given customers the opportunity to instantly access things like peer reviews, pricing information, and competitor offerings that are directly pitted against yours. Are you listening to customer feedback, and then actually changing your business model or your product to offer something better? Agile approaches embrace customer-centric approaches, placing them at the heart of the process. Once running an Agile program, the customer more naturally flows to the center of every project and discussion. With all these reasons in mind, I made the switch to Agile Marketing 10 months ago—and it’s been nothing short of revolutionary for myself and my team. We borrowed specific pieces from the Agile software method and applied the components that work for marketing. It was scary taking the Agile plunge at first, after nearly 15 years of traditional marketing management. But that’s what’s cool about Agile—you need to be willing to embrace imperfection (“fail forward fast”) and stay open to big-time change. It’s definitely a process, and a big change effort—but one that I believe will make or break digital marketing teams over the next few years as digital technology saturates every area of our field and corporate cultures. In my next post, I’ll dig into the specifics of how my Marketing team has adopted Agile. Stay tuned!